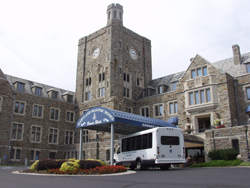 Situated on the pristine hillside overlooking Hunt Valley, Maryland Masonic Homes has become aptly nicknamed “Bonnie Blink” which is Scottish for beautiful view. What began as an infirmary and dormitory for aged and poor health individuals in 1934 is now a well-established community ideally located in the Hunt Valley – Cockeysville area. Maryland Masonic Homes offers safe, affordable and quality living for eligible Master Masons and their families. Our campus features majestic historic stone structures adorned by the 250-acre sculptured grounds. • Master Masons in good standing from any jurisdiction recognized by the Grand Lodge of Maryland. • Members of the Order of Eastern Star in good standing from any jurisdiction recognized by the Grand Chapter of Maryland, OES. • Wife, Husband, Widow, Widower, Children, Step-Children, Parent, Grandparent, Aunt, Uncle, Niece, Nephew, Sibling, Half Sibling, Remarried Widow or Widower and their Spouse, In-Laws (Mother, Father, Brother, Sister) of approved Master Masons or member of OES. • Applicants must be sixty (60) years of age or older.